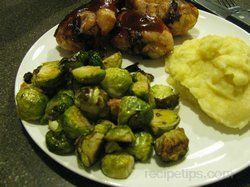 Brussel sprouts are becoming more and more common and served any night of the week, not just special occasions. Try this recipe if your still a little scared of this leafy vegetable. In a heavy bottomed pot over medium heat, fry the bacon until crisp. Remove bacon. SautÃ© the onion and garlic in bacon grease over low heat until soft, about 3 minutes. Add the brussel sprouts and stir them around so they are covered with the bacon grease. Add the broth and cook over low heat about 12-15 minutes. Stir in the butter and reserved bacon just before serving. 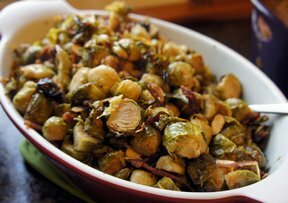 "I picked some small Brussels sprouts from my garden and used this recipe. 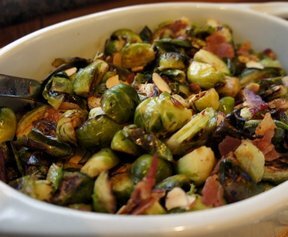 The bacon and onion are perfect with the Brussels sprouts. 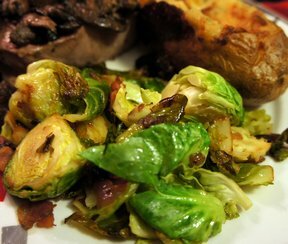 I really loved the crunch of the bacon with the tender vegetables."